Rest easy: Zynga once again owns the top game on Facebook. Yesterday, it acquired OMGPOP, the developer that suddenly unseated the social game giant after its overnight success with Draw Something. 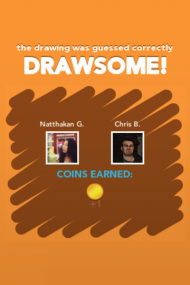 Draw Something, which challenges players to guess what another person is drawing, much like Pictionary, has been downloaded more than 35 million times in the past six weeks. But in making the acquisition, Zynga may have inadvertently set the expectation that if it doesn’t create the No. 1 game on Facebook — it will acquire it. In this case, that wasn’t a cheap thing to do. Zynga declined to say how much it spent on OMGPOP, but our sources say it paid $210 million, including $30 million in employee-retention payments. The message Zynga is sending with this acquisition is that it is committed to having the most popular games — a difficult and expensive proposition, especially if acquisitions are always the answer. Just ask Porter how difficult it is. It took him 34 attempts and six years to build a hit. Porter likened it to the music business, where he started his career. While busy signing every hot band he could find, the unexpected runaway hit was the “Dirty Dancing” soundtrack. Still, the stock market rewarded Zynga’s decision yesterday, sending the company’s stock up about 5.3 percent, to $14.45 a share, after getting confirmation of the acquisition at noon. However, by the end of the day, enthusiasm waned, and shares closed at $13.72 a share. Since going public in December, it’s been a rocky ride for Zynga. After raising $1 billion to make it the largest Internet IPO since Google, it has traded as low as $7.97 and as high as $15.91. Based on yesterday’s closing price, the stock is now up 37 percent. Acquisitions are hardly a new strategy for the company. Last year, it set a pace of buying more than one company every month, seeking both employees and new games to maintain its rapid growth rate. In this case, OMGPOP’s 40 New York employees will join forces with Zynga’s existing New York office, and Porter will become the new VP and GM. What really stands out about this acquisition is the price — at $210 million, it’s the most expensive company Zynga has purchased. Prior to this acquisition, Zynga’s largest buy was the $53 million purchase of Newtoy, the developer behind Words With Friends. That’s not to say that Zynga hasn’t attempted other big purchases. In 2011, it courted Rovio, the maker of Angry Birds, and unsuccessfully bid for PopCap, which instead sold to Electronic Arts for $750 million. Although Draw Something has been proven to be astonishingly popular in the short term, it doesn’t have the same kind of track record as Rovio or PopCap. The mobile game sits atop the iTunes “top paid,” “top free” and “top-grossing app” lists, an unusual accomplishment. On iTunes, it beats every single Zynga title — including Zynga Poker, which is frequently one of the highest-grossing apps. As mentioned at the top of this post, Draw Something is also the most popular game on Facebook. However, what’s interesting is that the game isn’t available on the social network. Instead, it uses Facebook credentials as a way for players to register on their mobile phones. From what we’ve heard, it has also been generating a lot of cash, based in large part on in-app purchases made by players. People familiar with the company told my colleague Peter Kafka that it has recently been netting around $250,000 a day from the game — after Apple takes its 30 percent cut. In an interview, Zynga’s Chief Mobile Officer David Ko said OMGPOP’s acquisition represents more than a hit game for the company.